Volleyball rules and regulations. Rules for conduct of players, coaches, and fans. Participants must accept referees decisions with sportsmanlike conduct, and not dispute them. In case of doubt, clarification may be requested only through the game captain. Participants must know the Official Volleyball Rules and abide by them. Participants must behave respectfully and courteously in the spirit of FAIR PLAY not only toward the referees, but also toward other officials, officiating crew, opponents, and spectators. Minor misconduct offenses arent subject to sanctions. It is the first referees duty to prevent the teams from approaching the sanctioning level by issuing a verbal or hand signal warning. The warning should be given to the team member through the team captain. This warning is not a sanction and has no immediate consequences. This warning should not be recorded on the scoresheet. Action contrary to good manners or moral principles, or expressing contempt. Defamatory or insulting words or gestures. Physical attack or intended aggression. The first rude conduct in the match by any team member is penalized with theloss of rally. A team member who is sanctioned by expulsion shall not play for the rest of the set and must remain seated in the penalty area with no other consequences. 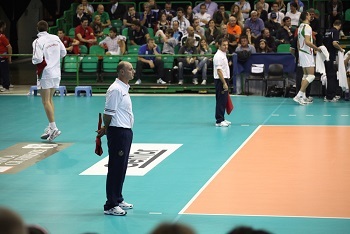 An expelled coach loses his/her right to intervene in the set and must remain seated in the penalty area.When facility space doesnt allow for a penalty area, a player or substitute who is sanctioned by expulsion shall not play for the rest of the set and must remain seated on his/her bench for the remainder of the set. Any other team member sanction by expulsion must leave the playing area, team bench and warm up area for the remainder of the set.The first offensive conduct by a team member is sanction by expulsion with no other consequences.The second rude conduct in the same match by the same team member is sanctioned by expulsion with no other consequences. A team member who is sanctioned by disqualification must leave the Competition Control Area for the remainder of the match with no other consequences.At a minimum, the Competition Control Area includes the warm up area, team bench area, spectator area, and playing area.The first aggression is sanctioned with disqualification and no other consequences.The second offensive conduct in the same match by the same team member is sanctioned with disqualification and no other consequences.The third rude conduct in the same match by the same team member is sanctioned with disqualification and no other consequences. All misconduct sanctions are individual sanctions, remain in force for the entire match and are recorded on the scoresheet. The repetition of misconduct on the same team member in the same match is sanctioned progressively (the same team member receives a heavier sanction for each successive offense). Expulsion or disqualification due to offensive conduct or aggression doesnt require a previous sanction. Any misconduct before or between sets is sanctioned according to the sanction scale and apply in the following set. Kenda S. Lenberg. 2005-2006: USA Volleyball Domestic Competition Regulations: pp. 5558.